I was so excited to see that 13 brilliant projects were linked up for the inaugural Sew it Chic in a Week link up! Did you find any new blogs and new seamstresses? I totally did and now my blog reader is even more inspiring. It was so much fun that I want to do it again! In fact, I went ahead and bought InLinkz service for the next 6 months so we can collectively see if this remains a fun way to share. Additionally, I would like to take this weekly opportunity to focus on one seamstress from the link up and learn a bit about her. This is Bryanna, and she blogs over at Sweet Shop Sewing. I was pretty excited to see that she is also a runner and a pattern designer! Last week she showed us her bright running top and it got the most clicks. Bryanna answered a few questions about herself so we could all get to know her. Thank you, Bryanna, for answering my questions so promptly when all of a sudden I got the idea to interview our featured seamstress. She was such a good sport! Made or blogged in the past week only – to avoid reposts. The party is open for a week, until next Friday, and I’ll open a new one Saturday. Feel free to link up every once in a while or try, like me, to complete a garment every week! If you are on a blogging platform that supports links, please link back to http://www.grayallday.com by using the Sew it Chic in a Week button in the sidebar, or just a simple mention in the text of your post. That way more people will find the party! Look around and share a comment or 2 with a neighbor. I don’t mind admitting that I savor blog comments as much as dark chocolate. They are encouraging and build community. I don’t know about you, but I follow more than 300 blogs in my reader. I love it! I love being inspired by the seamstresses in our community and seeing what they are up to! I also follow some fashion blogs, some running blogs, and quite a few craft blogs. What ends up happening is my blog reader is crammed full of posts to read at all times (so awesome) but it also means there are so many things to read I don’t always get to them all (especially on weekdays). And then I will miss some beautiful creations and am sad! My main interest is in sewing and fashion for women. I do sew and post about things I make for my daughters, and it is fun, but my passion is women’s clothes (and the reason I’m excited about making patterns). So I had the idea to hold a link up just for women’s clothes sewn in the past week. I really want to see everyone’s creations! I also want to encourage and build community. We all know what the bigger bloggers are sewing this week, but what about the huge variety of less well known blogs? 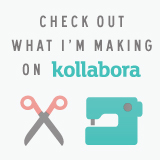 I know it takes quite a bit of time and energy to start and maintain a blog, time that could be spent sewing, so I’d like to open this up to Pattern Review pages, BurdaStyle pages and Kollabora pages. Those are definitely garments that need to be shared and admired, too. You may need to upload an image from your computer instead of the permalink page, though (specifically Kollabora). The party is open for a week, until next Saturday, and then I’ll open a new one. Feel free to link up every once in a while or try, like me, to complete a garment every week! Look around and share a comment or 2 with a neighbor. I don’t mind admitting that I savor blog comments as much as fine silk. They are encouraging and build community.